Article Note: This article was first published on 12th June 2012. We have last updated this article on 4th June 2018 with fresh information. As a web resource library previously, we always tried to provide you best possible information on latest web trends. So here again we decided to provide a good list of 21 best free Joomla templates currently available on the market. Joomla is getting more popular day by day as a Content Management System (CMS). So, users of Joomla are also increasing hugely. Now when someone decides to build a website in Joomla, the second task is always being to look for a good relevant template. This task sometimes takes too much time. Sometimes even it takes 2-3 days or more. So here we decided to provide you a resource that may help you to save your valuable time. If it will help even a single visitor, we will think our goal get some success. 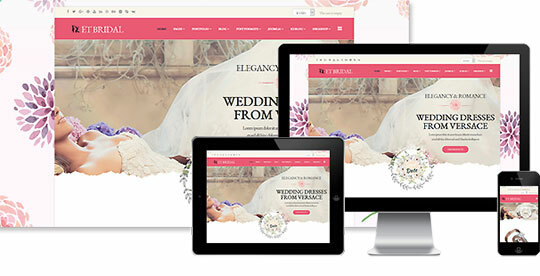 A responsive Joomla template, ET Bridal serves as an ideal choice for anyone looking forward to a wedding or bridal shopping site. Bootstrap CSS based layout ensures that the website is easily accessible and properly visible on all devices and platforms. The template offers 4 color options and various layouts to choose from. Font Awesome 4.3 (over 510+ Icons) also for menu items. Off-Canvas Menu & Mega Menu. Advanced Typography Options – Google Fonts with the update button. Compatibility: Joomla! 2.5.x and Joomla! 3.x (at latest version). Specialty: Custom CSS/JS Code fields, Social Comments, Cross-Browser Support. 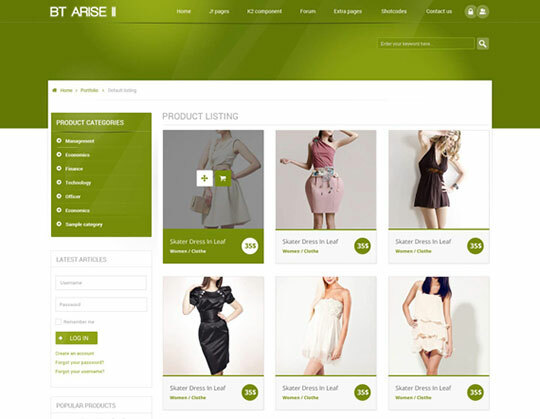 BT Arise is the first free template for Joomla 1.6 and 1.7 of Bow Themes. It comes in five amazing colors and styles. BT Arise presents fresh look for a Joomla site with eye pleasing colors and modules friendly arranged. Whether you need a site for your marketing, consulting, or business targets, BT Arise is still a powerful template to jumpstart dominating the world! Running on T3 Framework Version 2. Template support for MooTools 1.2. Compatibility: Joomla 2.5, Joomla 3.x. Specialty: Settings/Parameters, Multiple Color, Custom Fonts, Fixed width. Recommended for you: How to Create a Stunning Blog Using Joomla CMS? 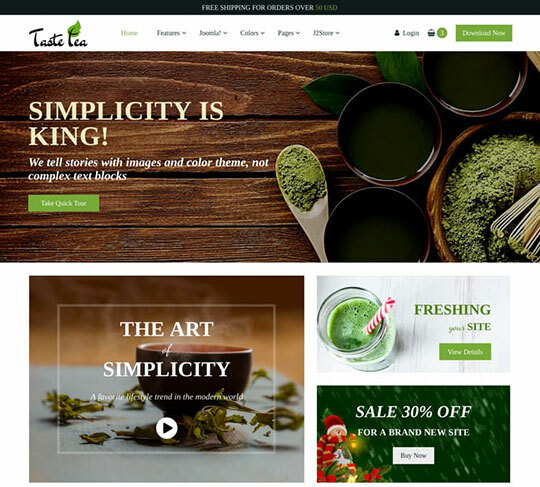 Offering a fresh look to e-commerce websites, JSN TasteTea is the perfect choice for single product businesses. An appealing design that attracts visitors, this eCommerce template can also be used to sell products directly with the J2Store extension. The responsive theme works well on all devices and platforms. Powerful extensions like J2Store, JSN PageBuilder 3 and Easyslider. 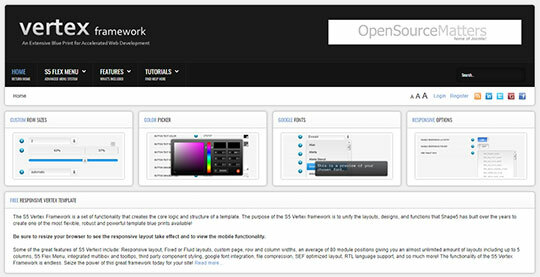 Sun Framework with Bootstrap 3. A rich collection of 670+ FontAwesome icons. Specialty: JSN SunFramework, SEO microdata support. 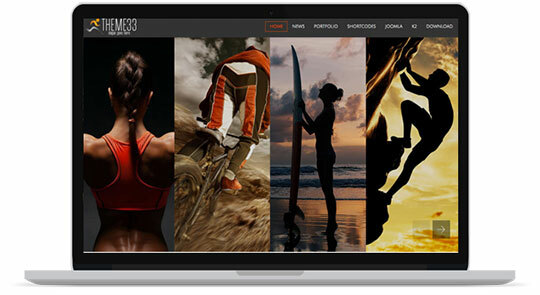 Based on Bootstrap Framework, TC Theme33 is a multipurpose free sports template. The theme consists of a variety of useful features like a set of CSS components, additional HTML elements and more. It is available in four ready styles and provides the provision of unlimited custom color. The theme is friendly across different browsers and platforms. Background color and text color from template parameters. Multiple Template layouts from template parameters. Slider controlled from the template parameters. Custom offline page with counter time. Compatibility: Joomla 2.5, Joomla 3. Specialty: Responsive template, Bootstrap Framework, Floating menu. 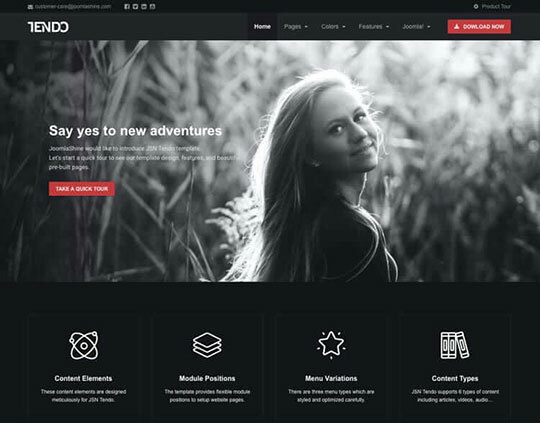 JSN Tendo is the artistic and elegant Joomla 2.5 template with powerful built-in features which let you create an awesome photo gallery website. Express your individuality with the most popular Joomla CMS on the market and JSN Tendo template. This photography-oriented template brings together a beautiful design and powerful built-in features that allow you to create an awesome website. The vast array of customizations is just excellent, giving you more control on the look and feel of the theme without having to dig into the theme editor (and PHP / HTML / CSS code). Tag: Portfolio, Interior, and Furniture, Beauty, Art & Photography, Architecture. Specialty: Settings/Parameters, Demo Installer, Custom Fonts, Fluid width, Fixed width. 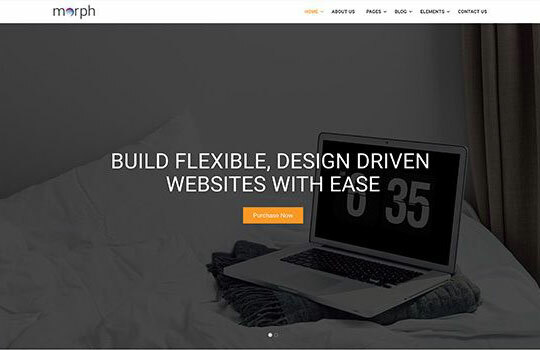 Built with cutting-edge technology, Morph is a multipurpose Joomla template. It has been crafted with several essential built-in pages and ensures the most flexible user experience. This theme makes it possible to build a website without writing a single line of code. Next-generation Intuitive page builder Quix. Easy to install and get started. Possible to load any Joomla component inside. Uniquely crafted 4 different homepage layouts. Compatibility: Joomla 3.x, Quix 1.8+. Tag: Business, Agency, Creative, Clean. Specialty: 100+ Google fonts, T3 Framework with Bootstrap 3, Extreme Customizability. You may like: Taking a Look at 404 Errors as a Successful Joomla SEO Approach. The Vertex Joomla Template is a 100% free GPL licensed template! Its purpose is to show off the powerful features of the Shape5 Vertex template framework. That’s right you get all the powerful Vertex features for free such as the S5 Flex Menu, 94 module positions, mobile device version, hide the component area on any page, custom row and column widths, RTL language support, and so much more! Unlike many free templates from other providers, that lack options or visual appeal, Vertex is not only packed with options but it looks great too! Consider it as a gift to our members and a celebration of the new Joomla 2.5! Customize the look of the theme with your own custom highlight colors and font and use its thousands of layout options to make your site truly unique. Be sure to check out the demo. Specialty: Settings/Parameters, Multiple Color, Demo Installer, Custom Fonts, Fluid width, Fixed width. Cryptocurrency has created a buzz in the market. Here is a theme that will interest cryptocurrency lovers and businesses. It is tailored to suit your individual needs and enables you to develop a website that is sure to impress and bring you the clients you desire. 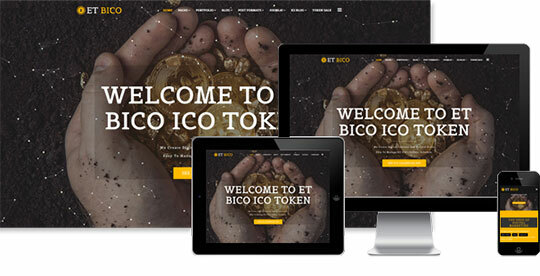 With this theme, you can stay assured your cryptocurrency business will have an up-to-date presence. Specialty: Custom CSS/JS Code fields, Bootstrap 3.2, Strong Framework. JSN Dome is colorful Joomla template with charming cozy design that would allow you to build a wonderful personal website. Leverage the power of Joomla to express yourself with JSN Dome template. Tag: Personal pages, Nature, Family, Art & Photography, Clean. 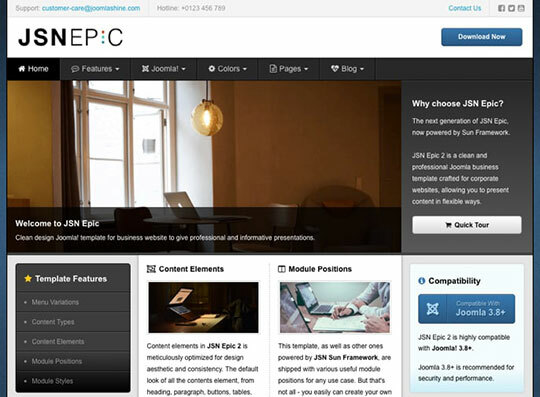 JSN Epic is a clean and professional looking Joomla template designed mainly for corporation websites. Equipped with powerful features, this template allows you to present content in whatever way you like. This elegant business template is not only beautiful but also very functional. The vast array of customizations is excellent, giving you more control over the look and feel of the theme without having to dig into the theme editor (and PHP / HTML / CSS code). Tag: Nature, Education, Business, Books, Architecture. You may also like: 6 Amazing Joomla SEO Plugins That Will Win Google’s Heart. A universal Joomla template, it can be used to build all types of websites. Developed with Bootstrap 4, it provides a smooth user experience. It has got the best drag-and-drop building tool. It can be used by consultancies, online shops, insurance firms and more. Tag: Online shop, Insurance companies, business, responsive. Specialty: Bootstrap 4, SP Page Builder, Ajax Rating, Pre-built pages. A 100 percent responsive Joomla template, OneClip has a minimalistic clean design. It can be easily used to showcase products, services or introduce a corporate, nonprofit or agency. It also offers support for multilingual websites. 100 percent responsive light template. 41 custom and premium add-ons. Drag & drop SP Page Builder Pro. 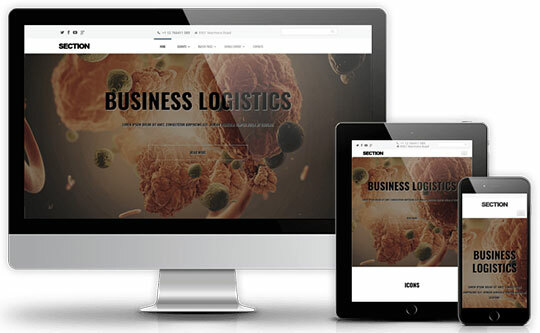 Joomla 3.5+ template with Quickstart. Tag: One page, responsive, business, product, services. Specialty: SP Simple Portfolio, Helix 3, multi-language. The SJ Directory Free is a free version of the popular SJ Directory template. 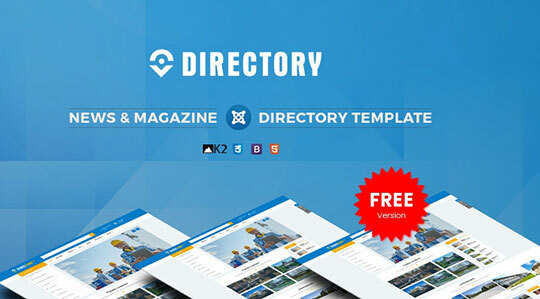 It brings the exclusive experience of SJ Directory template to users looking for a good, free directory template. The template has a clean layout and a modern design. It can be easily used to develop a high-quality news website, directory, blog or even listing websites. This professional theme comes with homepage designs that can fit any blog or magazine. Compatibility: Joomla! 3.x (at latest version). Tag: Responsive, magazine. Online directory. Specialty: K2 component, RTL layout, Mega Menu builder, fully responsive. SJ News II is an exquisite Joomla 3.x Template for News/Magazine Website, is built based on YT Framework V3 and integrated with the K2 component as a powerful content platform. The template comes with a clean coded design, along with 8 modern color styles and powerful mega menu, supporting RTL language and various content types as well as boxed and full-width layouts. It allows you to present content in a creative way to meet your ideas. 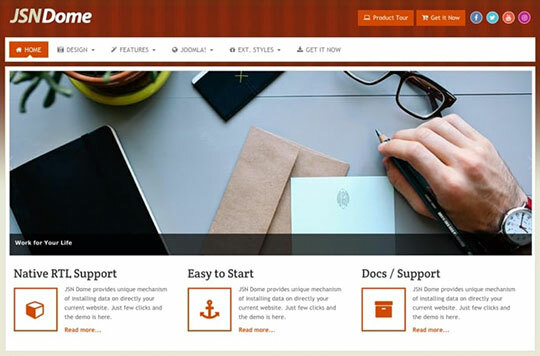 Support Front-end Cpanel for changing Theme, Layout and Reset instantly. Support 8 Preset Color Styles: Red, Blue, Chartreuse, Orange, Green, Purple, Brown, and Pink. Support various Font Family as well as Google Fonts. Support many styles for RESPONSIVE Menu: Mega Menu and Moo Menu. Allow setting site title, logo, and slogan. Typography and various module variations. Use Lazy Load for handling large images. Tag: News, Responsive, Directory, free, magazine. Specialty: K2, multi-language, YT Framework v3. Recommended for you: Building a Professional WordPress Website Using a Free Theme (without Coding)? 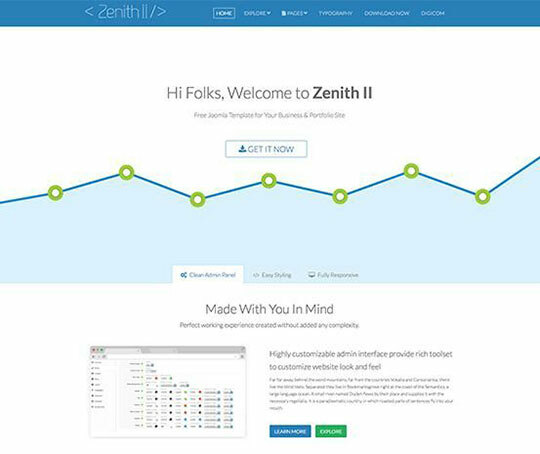 Responsive Joomla template with a host of outstanding features, ZenithII comes with Quix Page Builder. It has T3 Framework in the core and Bootstrap Framework in the frontend. The 50+ elements of Quix make it possible to add your imagination with website creation. It also comes with an off-canvas menu to set menu options for smaller screens and devices. You also get a 2-dimensional menu builder. Compatibility: Joomla 3.x+, Quix 1.7+. Tag: Business, Agency, Image gallery. Specialty: Quix, Custom pages, 2D Mega Menu. 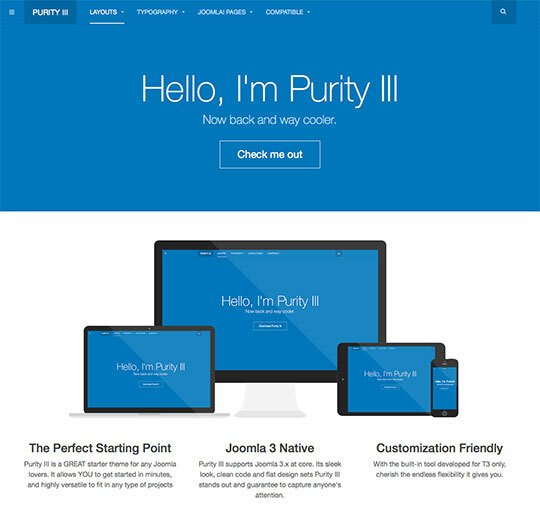 From simple to complex websites, anything can be made with Purity III templates. A responsive template, this template for any Joomla project that you have in mind. It is built on the T3 framework that makes the template responsive and high compatible with Joomla extensions. You can use Layout configuration or ThemeMagic to customize the template as per your idea. Make website development challenging and exciting with Purity III. GREAT starter theme for any Joomla lovers. Bootstrap 3 at the core. Tag: Ecommerce, magazine, Portfolio, Business. Specialty: ThemeMagic, Bootstrap 3 Framework, Open source T3 Framework. 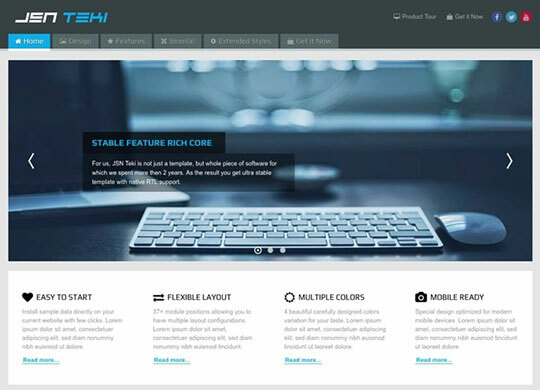 JSN Teki is the hi-technology Joomla 3 template designed for gadgets fan lovers. With powerful built-in framework and mobile support, you will see a well-optimized browser layout on your desktop or mobile devices. The template’s new version checking mechanism works automatically. You will be notified if the version you are using is out-of-date. There are 14+ languages supported in total. Besides these, there are Improved HTML and CSS code of all clearing tags, Utilized CSS3 for all mouse over actions and more. All of these bring you a lot of conveniences and make your website look cooler than ever. Tag: Software, Mobile, Hosting, Electronics, Computers. 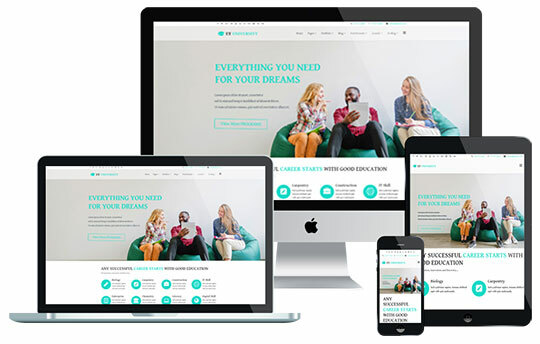 A professionally designed University template, the template has been specially tailored for college, university, and education. It comes in 4 color styles with a flexible homepage, full width, and boxed layout. Presence of HTML5 and CSS3, the drag-and-drop tools makes it easy to customize. Excellent features such as a responsive nature and cross-browser compatibility are also included. Unlimited module position, strong shortcodes assist your present content easily. Compatibility: Joomla 3, Joomla 2.5. Specialty: Improved Layout Manager, Custom CSS/JS Code fields, Social Comments, Cross-Browser Support. 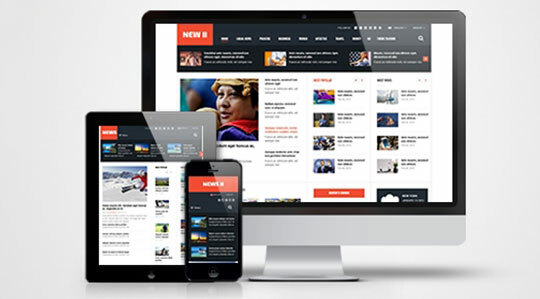 You may also like: 10 Premium WordPress Themes Great for News, Magazine & Editorial Sites. The SJ TheCool Free – Elegant Responsive K2Store Joomla Shopping Template is one of the best free eCommerce Joomla templates. It has been powered by K2Store component and Helix 3 framework. 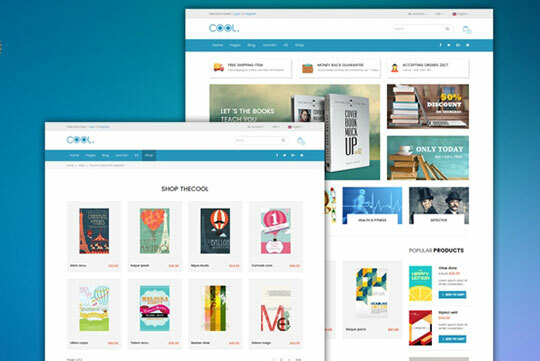 It can be used to build a beautiful online store, a simple online bookstore even a blog, news portal site.SJ TheCool Free comes with a professional homepage design that well fits any eCommerce Joomla sites especially bookstore website. Tag: Online shop, Portal, Business, E-commerce. Specialty: K2 Store, Mega Menu, RTL Ready, Helix 3 Framework. A multipurpose Joomla template, Section can be used to create various types of business, corporate or marketing sites. It has a fully responsive layout. The configuration works well on any screen size or device. Specialty: Quickstart installation, Bootstrap 3, jQuery Enhancements. 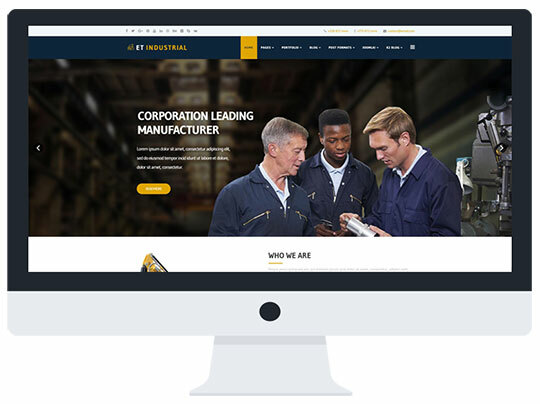 ET Industrial is Responsive Joomla template that targets for industrial companies. Industrial Joomla! template builds with latest Bootstrap CSS Framework, Support Font Awesome and K2 extended style. Besides, Industrial Joomla template is also included 4 color schemes and boxed layout to make your template look more motivated and attractive. Industrial Joomla template is highly customizable and flexible in order to make sure they will fit your business and vision the best. Bootstrap 3.2 Optional Fixed (sticky) Header. Specialty: Bootstrap 3.2, Off-Canvas Menu & Mega Menu. A selection of the right template for your website will make a great difference to your business as it will attract a lot of traffic by boosting the interest of visitors in your website. So, when you are planning to choose any free Joomla template to make sure you list down your website requirements very well and then try to match it with the features of template you are planning to choose. This will definitely help you to pick an ideal Joomla template for your website. Is there any free joomla template for directory listing site. First one is Purity III by Joomlart and the second one is JM Services by Joomla-Monster. You have shared a useful post with a nice collection of Joomla templates. Such templates will surely give an appealing look to related websites. I also have designed templates with the help of the template – toaster. Users may take an advantage of using this software. Can you suggest a joomla 3.0 template for a law firm? You can use any business template of Joomla 3. If you represent your images and content (related to law firm) well in any business template of your choice, you can build any good website for your law firm. 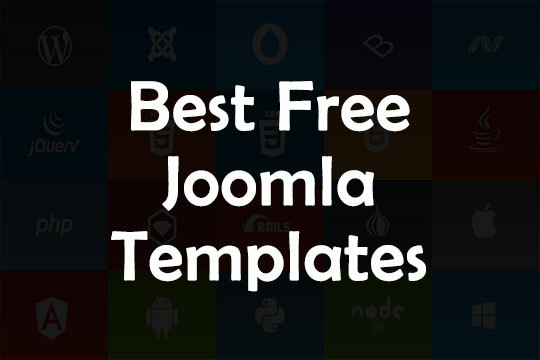 Many of the above templates are already upgraded to Joomla 3.x. You can check on the respective websites. Some of these templatea and it’s design has a smooth and corporate feel, most probably I prefer to choose joomla templates only as it allows you to promote your products or services online with a professional and serious business appearance. It’s pleasure to meet a joomla expert here. I would like to have an advise from you. I have a basic HTML+CSS static web site and I want covert in to joomla CMS. Do you know any good software for it ? or can you give me some easy steps for the same ???? @Ann Thanks for the heads up! where did you find spyware? Very nice templates, thanks for sharing! very nice links thanks for the links. Best Me. They’re very far from “BEST”. I just downloaded and installed the latest version of “DesignCanvas” by Joomlage (with the Joomla 3 package) and I am sad to say that it looks nothing at all like the images you show above. In fact, it is plain and ugly has now been deleted from my machine. A shame, because the inages do make it look good. I was trying to remove the copyright in grandiose template but i couldnt ..can u please help me with that ??? You can find one tab in template manager called “Additional Features”. Here you can get some features to on/off footer copyright info. You must purchase a link removal from Pixel Point Creative to remove the tab. Thanks for this collection, good work; long live! thanks for sharing some lovable templates. i download 2 of them and i will now try to add them into my web site. is this totally free templates? Great Collection. Well done. Grandiose Template is pretty cool. Some of them are really impressive! surf this site .. this is vry useful for tech support……. You can use the following templates: Oxygen – By Joomla51, BT Arise – By Bow Themes, Td Cletra – By JoomlaTD, JSN Epic – By Joomlashine. These templates are obviously fully not ready for an eshop, but you can easily add and configure any shopping cart extensions along with these. i wanna create a website for maintain my profile..can i have better template..
please send to my mail id..
Nice Collection here ! all the templates I need all under one roof.I am actually spoiled for choice. template td_cletra I have issues with it.the top modules are disappearing.i dont understand why yet I have published them. I’ve spent literally DAYS searching for a truly 100% free, customizable, banner-less, link-less, ad-less etc. Joomla template and while a few of these in the list aren’t exactly that (some are limited in use, while others require signup or payment etc. ), after a few look see’s, I was FINALLY able to find a suitable match for my needs here. Thank you VERY much for posting up these!! thank you so much.I find a many site to get Joomla templates.but I can’t find to suitably good template.your templates is soogood my dear.thank you very much. Thanks for share look likes. Yes, your choice is good. Thanks for sharing. thanks telling about joomla templates..
i need a news joomla 2.5 free template for my project. can you suggest any template that can be installed easily and all the plugins and extensions available. Any of the above template can meet your requirement. Just choose your preferred design and go for it.